Stereotypes and prejudices are not only expressed towards human beings, but also towards robots, says Jasmin Bernotat. She works in the “Applied Social Psychology and Gender Research” group, which is headed by Professor Dr. Friederike Eyssel, at the Cluster of Excellence CITEC. Radio host Jan-Michael Stiegelmeier from Campus Radio Hertz 87.9 presents her research project on stereotypes. In order to study stereotypes, Jasmin Bernotat uses the eye tracking method, more specifically, the visual world paradigm, which is used to investigate the extent to which spoken verbal information influences participants’ gaze behavior. Using this paradigm, the psychologist can examine the influence of stereotypes on language processing. 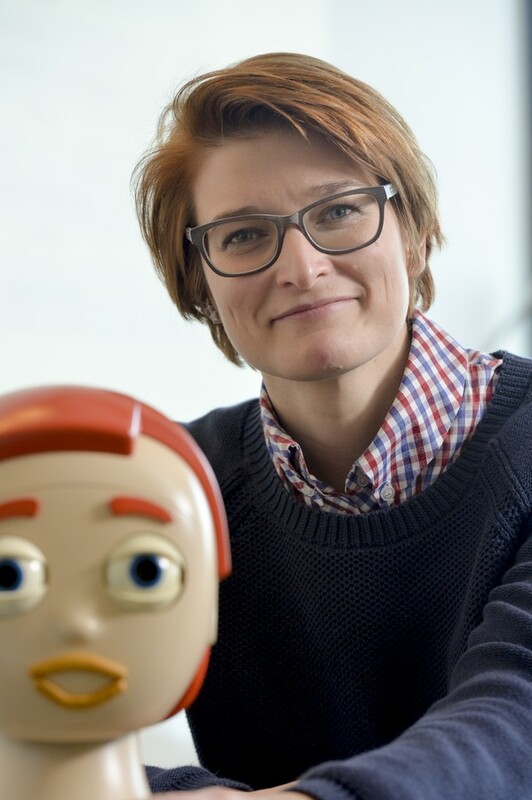 In the radio program, which was produced in cooperation with Radio Hertz 87.9, Bernotat furthermore explains how gender stereotypes are also assigned to robots. Jasmin Bernotat studied psychology at Bielefeld University from 2009–2015. For the past three years, she has been working as a research associate and doctoral researcher at CITEC.